We’d had the Mezcla recommended a couple of times – both for the price point (not too expensive), and the quality of the Tasting Menu. At $49 for 6 courses – it’s a bargain of outstanding proportions! The Mezcla is located on a side street in Montreal’s ‘Latin Quarter’. At the heart of the district is St. Catherine Street – which becomes a Pedestrian Only throughfare packed from dusk till late with couples of all descriptions. It’s one of my favorite parts of the city – and the thought of a great restaurant within easy walking distance was enough to make me call for reservations – pronto! We went on a relatively ‘quiet’ Wednesday night – expecting diners to be few and far between – but the place was at least 3/4 filled. I can easily imagine waiting lines on the weekends. The place is tiny – I’d guess a max of 20 tables, and there’s a ton of staff. I saw at least 5 different wait-persons for sure. So I wasn’t surprised that the service was at a high standard. Dishes were presented by multiple servers, ensuring that everyone got to enjoy their dinner at the same moment. The only serving failure was at the very end. For no discernible reason, there was a considerable delay between our dessert course and the presentation of the bill. Rare that – generally they want to turn the tables! I guess we’d passed the turning point – and I will admit, we were definitely not rushing our charming, and very knowledgable server. 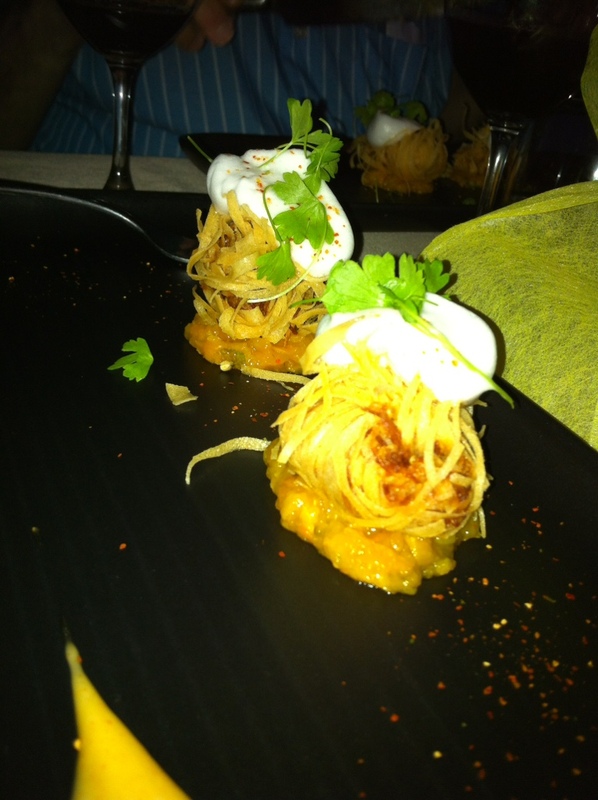 But at the Mezcla – the food – and the presentation of same – was clearly the highlight. I was amazed. Course after course was seriously delicious – and surprising. The Mezcla claims a South American vibe – so flavors were definitely different. Lots of citrus for sure. 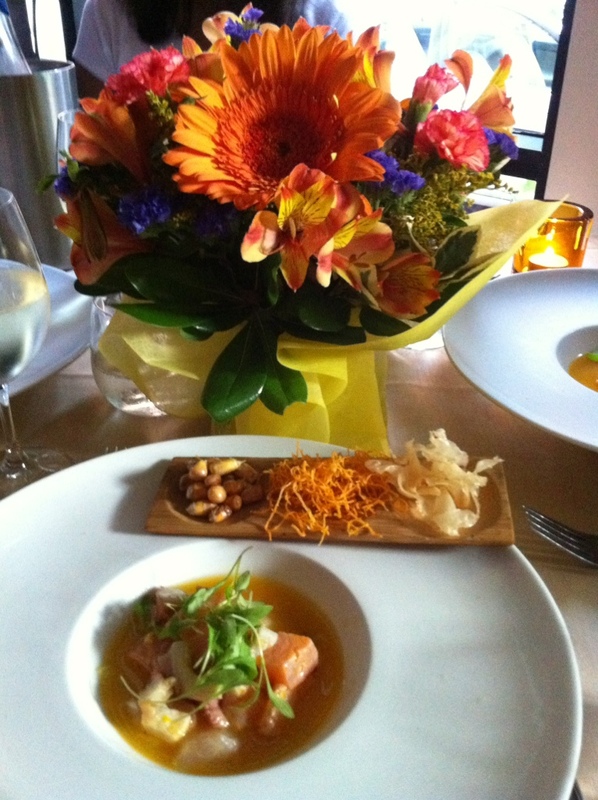 My favorites of the 6 courses – and I have to say that I’m picking dishes that were absolutely outstanding – not just seriously good – were the Ceviche and the Scallops. They were stunning – not just in flavor, but in presentation as well. The Ceviche was a bowl full of deliciously marinated fish chunks, large enough to be easily identified as salmon, tilapia, and octopus. At the table, the server poured the positively yummy sauce over the fish – explaining that we were to eat the fish with our fork, and when it was gone – she’d bring us spoons to enjoy the sauce. But I couldn’t hold out that long. So I used my spoon to eat both at the same time – reveling in the multiple textures and flavors. Yum just doesn’t describe it. But the stand out for me was the scallops. Such a pedestrian protein – here presented in a fried ‘nest’ made out of strips of puff pastry and topped with a foam. Pictures simply can’t do it justice – it was sweet, and crunchy, and delicious! I ate my entire portion – and then ate 1/2 of another serving. Yes, it was that good. For dessert, they served a light, yet satisfying tropical home-made ice-cream with a dulce de leche sauce. Not too sweet either. A wonderful way to end an outstanding meal. Complaint – like most ‘modern’ bistro restaurants, there’s little space between the tables, and the hard surfaces guarantee a noisy environment. Not too bad when we first sat down, but increasingly annoying as the meal continued. At the end, I could barely hear anything the people at our table were saying, nor understand the explanations given by our server. Despite this – the Mezcla is a winner, clearly a winner. ← Tratoria La Festa – Consistency Counts – and Yummy matters even more! Looks delicious! Mezcla is just that–a mix of all of Latin America, or do they ‘claim’ particular countries/regions? As per other descriptions – Peru, Chili, Argentina – ‘New Latin’. But since they mix it with French as well – it’s really hard to say percisely.